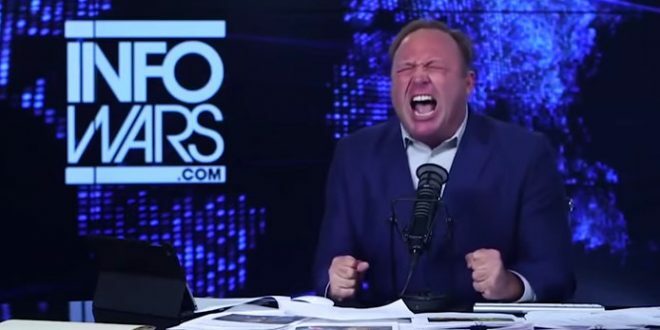 Alex Jones Begs Trump For Help With "Censorship" - Joe.My.God. “Mr. President, America knows you’re real. They know the Democrats are the anti-American globalists allied with the ChiComms, radical Islam, the unelected EU, and others. If you come out before the midterms and make the censorship the big issue of them trying to steal the election. And if you make the fact we need an Internet Bill of Rights, and anti-trust busting on these companies, if they don’t back off right now. “And if you don’t come out and point out that the communist Chinese have penetrated and infiltrated and are way, way worse than the Russians — because it’s true, and the Democrats are scared of that coming out. You’ve got the Feinstein info coming out and more’s about to come out just as I’ve told everybody. Then they will be able to steal the midterms and start the impeachment.